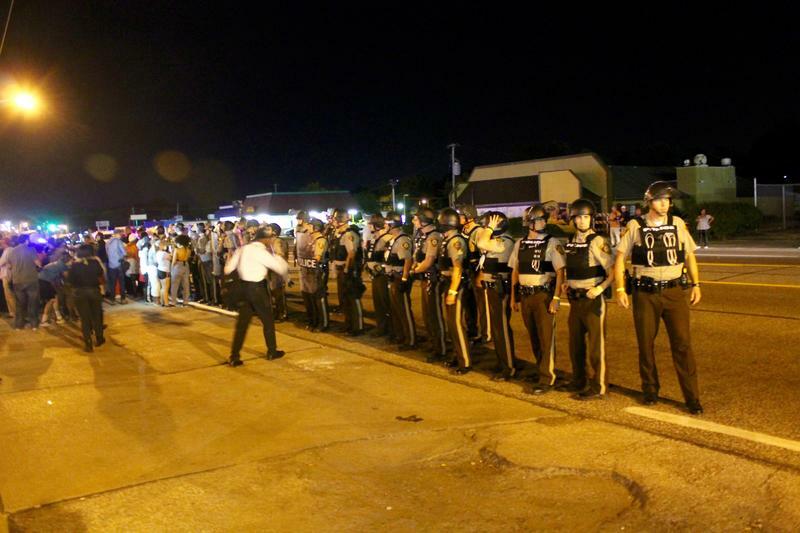 St. Louis County Police form a line in front of protesters on Tuesday. They were put in charge of securing protests on Monday when St. Louis County Executive Steve Stenger called a state of emergency. Updated 10 a.m. Friday with lifting of state of emergency. 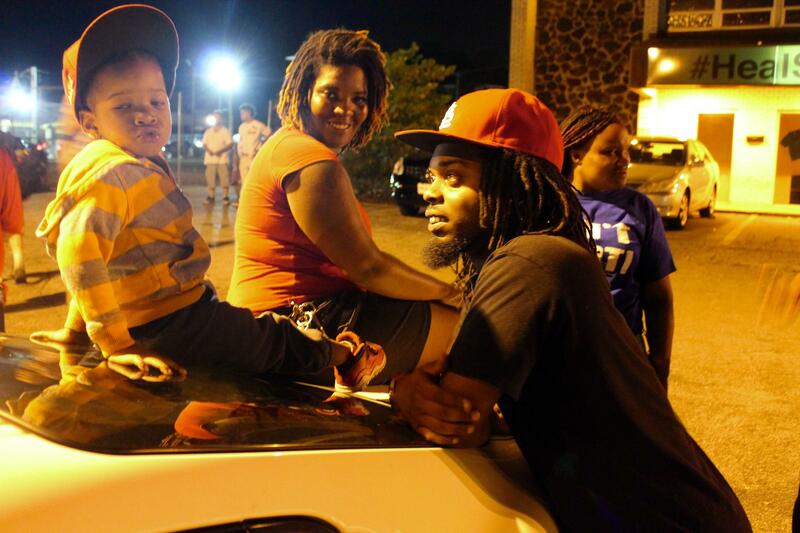 On a cloudless Tuesday night on West Florissant Avenue, the mood was relatively calm. A few dozen protesters, onlookers and media milled about on a parking lot – a far cry from chaos that struck the thoroughfare on Sunday night. At some point though, a group of people moved into the middle of street. They blocked traffic. They started chanting. And they were met with a line of police officers clad in riot gear trying to get them to move back to the sidewalk. One of the people in the middle of scrum was St. Louis County Police Chief Jon Belmar, who was personally trying to get people out of the street. After a few tense moments, things calmed down considerably – and the rest of the night beat on without incident. Protests on Tuesday and Wednesday transpired with no arrests. This was but one scene in Ferguson during St. Louis County’s state of emergency, which took effect on Monday afternoon through the order of St. Louis County Executive Steve Stenger. After a tense Monday night, the site of the protests was much calmer on Tuesday and Wednesday nights. 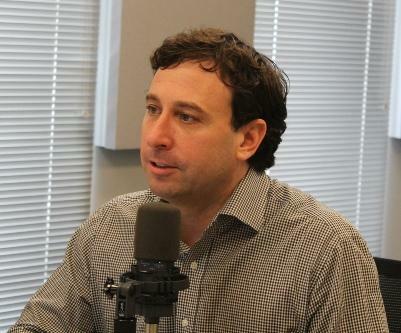 Stenger lifted the state of emergency on Friday morning. “After reviewing the events of the past four evenings, under the state of emergency, I am pleased to report our law enforcement officers have established order while preventing further acts of violence in Ferguson," Stenger said in a statement. "I want to emphasize local law enforcement will remain vigilant, and officers are prepared to respond swiftly if necessary." 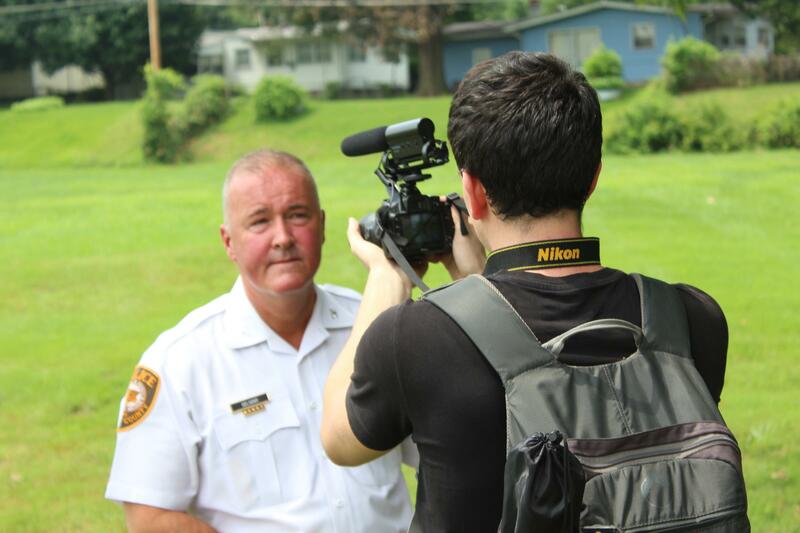 Stenger contends the swift action helped stabilize a volatile situation after an officer-involved shooting on Sunday, primarily because it placed Belmar and the larger St. Louis County Police Department in charge of the security situation. But others are less sanguine about Stenger’s state of emergency order, contending it stoked more fear and worry than what was necessary. Some have decried what they saw as overly aggressive tactics on Monday night, when nearly two-dozen people were arrested in Ferguson. For those that followed the St. Louis County executive’s contest, Stenger’s decision to call a state of emergency isn’t that surprising. Former St. Louis Police Chief Tim Fitch says Stenger made the right call in declaring a state of emergency. He was stationed at the police command center since last Friday as part of his consulting business. One of the reasons calling a state of emergency in this instance was significant is it effectively gave Stenger the power to provide orders to the St. Louis County Police Department. 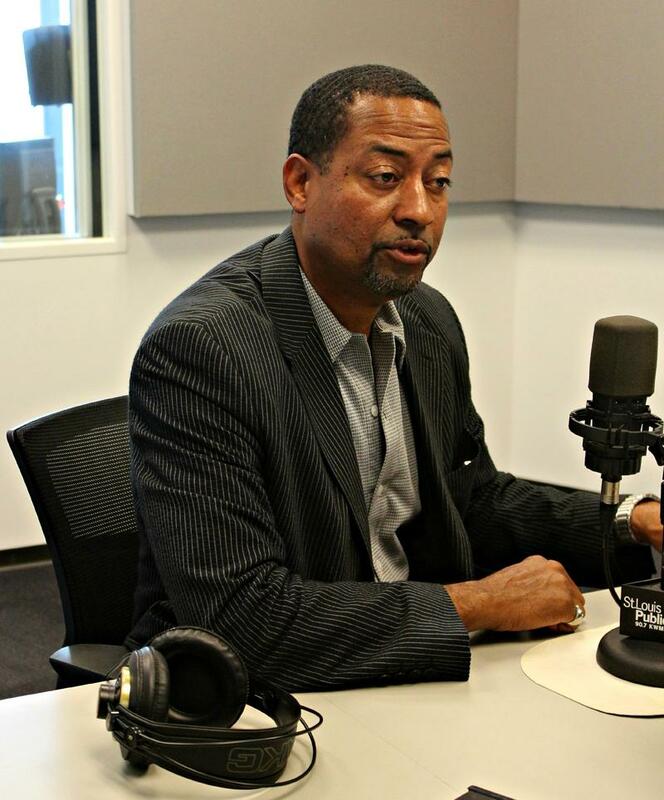 In non-emergency circumstances, the St. Louis County Board of Police Commissioners – not the county executive’s office – has control and oversight over the county police. After he issued the state of emergence order, Stenger placed St. Louis County Police in charge of securing protests in and around Ferguson. As part of his police consulting business, Fitch had been at the police command post since last Friday watching the situation in Ferguson. He said Ferguson police were far too indecisive in dealing with the situation on Sunday which necessitated a change in strategy. “For example, he had warning given to the crowd to clear the street or they would be arrested,” Fitch said. “He was up to warning number 18 when the big shooting occurred, with the multiple dozens of shots that were fired. And then, [it] eventually culminated in the officer-involved shooting. “So something needed to change, and I thought it was a good move on the county executive’s part to remove the Ferguson Police chief from command,” he added. Stenger, however, was more diplomatic. St. Louis County Police Chief Jon Belmar has been heavily praised by Stenger during the state of emergency. Stenger said the fact that Monday featured no gunfire, robberies or major property damage showed the state of emergency was working. He credited Belmar and his top staff for repeatedly going into the crowd and trying to de-escalate tense situations. “I just think it was the efforts of de-escalation and also I think having a structured environment really, really worked well,” he said. Some Stenger critics, though, were less enthusiastic about the decision to call a state of emergency. 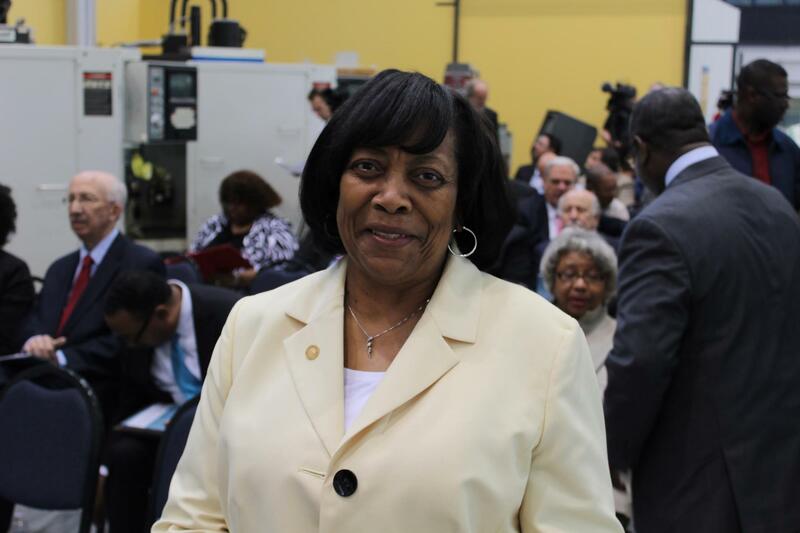 St. Louis County Councilwoman Hazel Erby, D-University City, wants to raise the county's minimum wage to $15 an hour. For instance, St. Louis County Councilwoman Hazel Erby, D-University City, said the decision shaped a national narrative that the situation in St. Louis County was out of control – and in effect created more attention and fear than was necessary. Others were disenchanted with some of the tactics used by police. Ladue resident Susan Clark said on Tuesday that she had waited outside the St. Louis County Justice Center for people to be released from custody and she "did not see a single person come out of that jail last night – and I sat there for 12 and half hours – that didn’t have cuts, bruises, abrasions, something." And protesters like Mary Chandler noticed a big difference between how police treated protesters compared to others – such as the controversial Oath Keepers. Stenger is asked about the Oath Keepers' presence in Ferguson. Darnell Wilkes and his son Khalliel wait around at Tuesday's protests along West Florissant Avenue in Ferguson. Earlier this week before the officer-involved shooting occurred, Belmar stressed that his department and other members of law enforcement have taken Brown’s shooting death to heart. And, he said, that’s influenced his department’s approach. 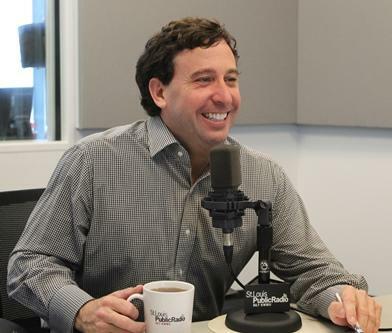 Click here to listen to Rosenbaum’s NPR Morning Edition story. After a relatively calm Tuesday night in Ferguson, St. Louis County Executive Steve Stenger may be close to lifting his state of emergency order. But it won't happen on Wednesday. 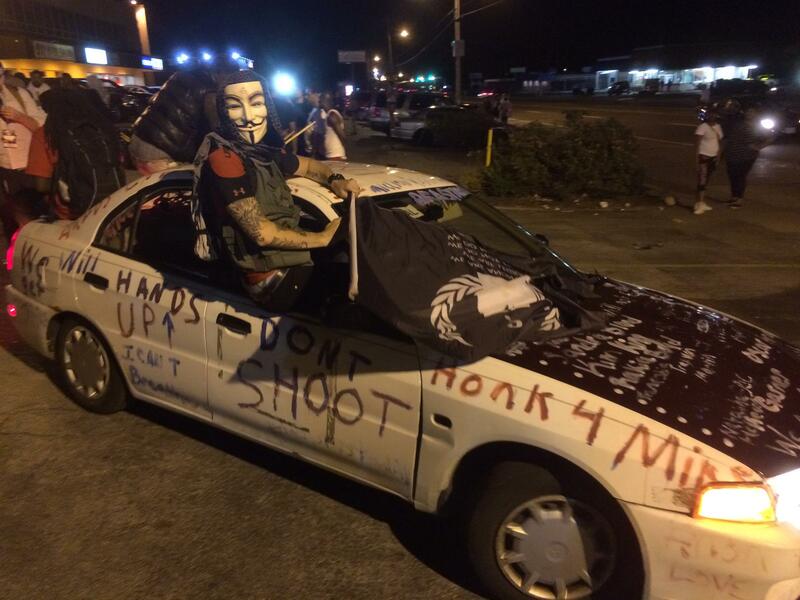 Tuesday's protests on West Florissant Avenue were largely uneventful. While police pushed protesters out of the street, most people along the thoroughfare mingled with each other and marched around the street without incident. 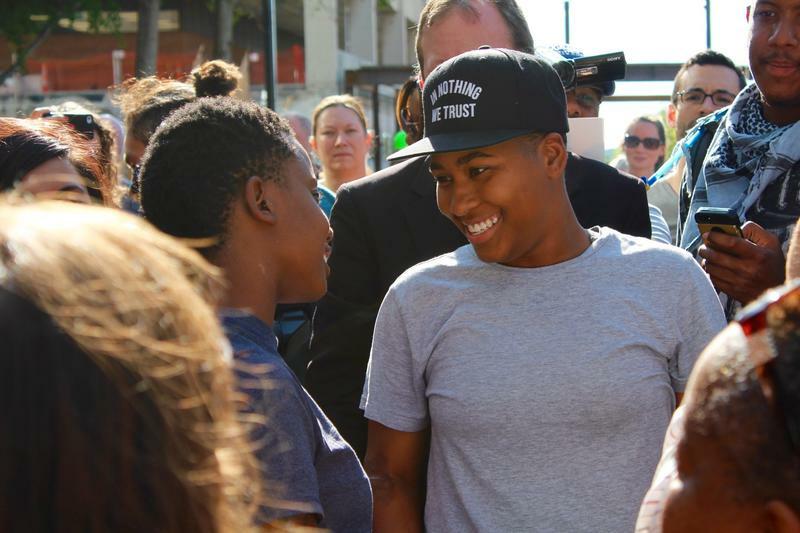 Two of the most familiar faces on the front lines of protests in Ferguson and elsewhere are facing several charges for their conduct during a protest Monday on Interstate 70. Both Brittany Ferrell, 28, and her wife, 21-year-old Alexis Templeton, face peace disturbance and first-degree trespass charges for being part of a group that blocked traffic in both lanes of the interstate near the Blanchette Bridge for 30 minutes on Monday near the height of rush hour. Both of those are misdemeanors. 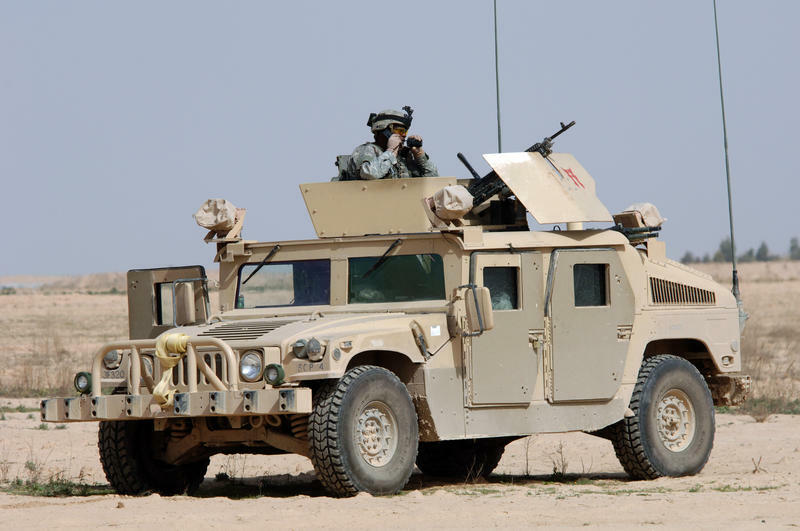 The Pentagon is asking Missouri to retrieve two Humvees from Ferguson. The reason for the request is an apparent discrepancy in documentation over how many Humvees are on the books for Ferguson. The Missouri Department of Public Safety says its records show four Humvees in Ferguson, but the Pentagon’s records reportedly only show two assigned to the city. Since last August, local business owners have provided the nation with an alternative narrative of Ferguson and neighboring Dellwood.